Amsterdam, Netherlands was like something I’ve never seen before. The whole time I was there it didn’t feel real. The city is flooded with canals, bikes, awesome museums, and delicious food. The city has over 100 kilometers of canals, 90 islands, and over 1500 bridges. These canals are lined with storybook houses. Some are tilting because they were built on stilts and the land is shifting, but they are all tall and slim with open windows and hooks at the tops of them so they could bring the furniture in through the window. These canals are also lined with bikes! Every where you go people are zooming past you in individual bikes or two person bikes. I had the opportunity to go to The National Amsterdam Museum, Van Gogh Museum and the Tulip Museum, Each were equally fascinating. The food was my favorite thing. They had every food you could imagine and they weren’t lacking on the sweets. The Stroopwaffels were life changing in the famous Pancake Factory blew me away. Amsterdam was different from all the other cities I’ve seen so far and that’s what made it so special. I will definitely be going back! One of my favorite places that I visited during my time in Germany was Strassbourg, which lies just within the borders of France. Strasbourg is a very interesting city because it has been passed back and forth between France and Germany many times over its lengthy history. Because of this unique history, there is a strange and wonderful cultural blend between German and French cultures. Although they are a part of France, and French is the official language, it isn’t hard at all to find someone speaking German in Strasbourg, or as the Germans spell it, ‘Straßburg’. This was definitely an advantage for me, as my French skills were virtually non-existent. Strasbourg is pretty touristy, so it wasn’t hard to find menus in English, but it’s always possible to run into a language barrier. While visiting Strasbourg, I would definitely recommend climbing the tower of the cathedral. While entering and viewing the inside of the cathedral is free, climbing the cathedral is not. Luckily, most places in Strasbourg offer a significant student discount. While the view from the top of the cathedral is not necessarily the most amazing in Europe, it does offer a nice view over the tops of the low buildings that make up most of Strasbourg. I would also recommend stopping for a glass of wine or a hot cup of coffee in ‘Petite France’. This part of the city is very old and historical. From here you can also take a boat tour along the picturesque canals of the city. Overall, Strasbourg is an amazing city and deserves a visit, especially if you’re studying in Western Germany or Northern France. One big difference I noticed abroad was celebrating different holidays and traditions. My first month abroad, Costa Rica had its Independence Day on September 15th. My program had us celebrate by taking part in the Independence Day parade and making faroles, which are decorative lanterns children typically carry through the parade. We got to walk in the parade and see all of the festivities that took place in the town center. It was strange being abroad in the fall, because Costa Rica does not celebrate Halloween or Thanksgiving. Some people dress up in the bars on Halloween, so I went with other Americans and we all had some sort of costume, even if it wasn’t well put together. Although it is not as important of a holiday to me now that I am older, it was still strange not seeing decorations up. It did not even feel like Thanksgiving when the day rolled around. I had class in the morning as usual, and in the afternoon I went out with my professor to find a fabric I was looking for to use in a project for his class. I called my family and they all talked about how much they missed me and what they were doing, which felt strange to watch from the outside. Later, my study abroad program set up a dinner for us at a restaurant where we ate typical Thanksgiving food. It was not a bad day, it just felt very confusing. One interesting aspect of traveling abroad is the language barrier and learning to speak a new language. I took Spanish all throughout high school, although our classes were not very advanced, and in my first 2 years of college. I was excited to spend four months in a Spanish speaking country. I did not think about my growth in the language much during my time abroad, but it is interesting to reflect and see how far I have come. When I first arrived, I was nervous to meet my host family. My 26-year-old host brother spoke English, but his mother, aunt, cousin, and grandparents who all lived with us did not. I came to their house late at night, so we had a quick conversation before bed. I was able to communicate with them just fine and they kept telling me my Spanish was advanced, but I know it needed lots of work. I started the semester with a month-long class in Intermediate 2 Spanish. I could hear myself improve in grammar as well as my speaking skills throughout the month, and I continued to practice outside of the classroom. When I was with my friends we typically spoke in English, so I made sure to go some places alone. I continued to better my speaking skills in stores, with my host family, and in taxis. I even went to a Spanish conversation group to talk to local college students. Even though I’m not a fluent speaker, I now feel comfortable speaking Spanish. 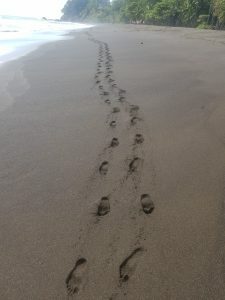 Some of the most popular places to visit in/near Costa Rica are the beaches. To travel, I always took the public bus. 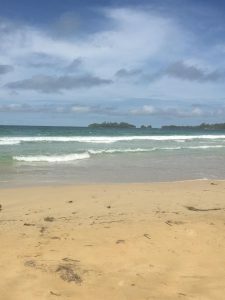 Here is a list of the beaches I visited and what I thought about them! This is a very touristy beach just about 2 hours away from San José. It was a popular first weekend destination. This beach ahs a big town and lots of souvenir shops. The beach itself is a bit rocky and not one of my favorites, but it is close and good place to learn to surf. This town also has a very busy night life- which can be fun, but also dangerous. Most students studying in San José will visit at least once. This beach is about 15- 20 minutes away from Jacó, and a prettier beach. It still has all the restaurants and you can travel to Jacó for the evening if you would like to go out. The sand is black and very hot. The waves are more intense here, so it is typically recommended for more advanced surfers. You may even see a famous surfer or a surfing competition while you visit. This is also a national park about 5.5 hours away from San José. This park is on the Caribbean side, so the water is very clear and he sand is white. It was rainy when I visited, but it was clear that this beach was very clean and peaceful. The town of Cahuita is small, but cute. There are plenty of places to stay for under $40 a night (cheap when sharing a room with friends) and lots of restaurants to try. 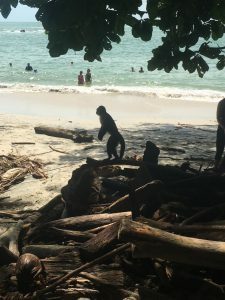 This was probably my favorite beach, located on a small island off Bocas Del Toro in Panama. 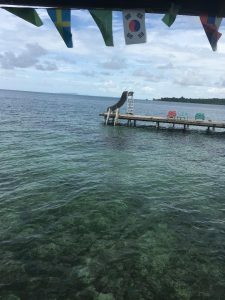 The trip to Panama was about 7 hours and then another hour to the water taxi that took us to our air bnb in Bocas. The beaches in this area were all white sand beaches with blue and clear waters. They are quite touristy, which means they have restaurants, bars, and activities on all of them. I got to go snorkeling off one of the islands and the water was very clear with lots of organisms to see. The water taxi rides to/from the different beaches were unique experiences of their own. Activities here were less expensive because the cost of living is less expensive in Panama. It’s a long trip, but I would recommend going! This beach is about 4.5 hours from San José. It is located in the Guanacaste province and has light sand. The beach is big, the town is touristy, and there are many nice restaurants on the beach. When I was here, I went horseback riding and I rented an ATV with a friend. 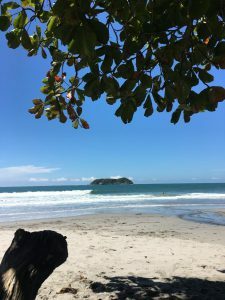 Many of the beach towns offer these options, and I liked being able to do touristy activities as well as just relaxing on the beach throughout my time abroad. 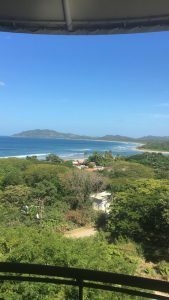 For the last weekend, I went with a group of friends to this beach, also located in the Guanacaste province and about 5.5 hours away. It was incredibly hot and humid here, but also beautiful. This was one of the prettiest beaches I saw and had many shells. It was difficult to get in the water at some points because of the large rocks. This town is one of the most touristy, which means there are lots of people trying to sell you things. That can be annoying or a good thing if you want some coconut water on the beach. Our air bnb was very nice and we had a great time here.